I’m not a reality TV show fan in the slightest – I don’t watch any, in fact. But that doesn’t stop me from being interested in the style behind the camera! One person I always love to keep tabs on is Giuliana Rancic – she seems like such a genuinely nice person and has a great sense of personal style. I always love the gowns she wears when interviewing celebs on the red carpet and her day-to-day style hosting E! News. That’s why I was intrigued when I heard she designed a collection for HSN and had to take a look! If you’ve seen my outfits over the last couple weeks on here, you’ll know that I’ve taken more of an interest in sleek leather (real and faux) jackets. With the amount I’ve been traveling lately, jackets like this one from Giuliana’s collection are multi-functional and can be worn from the plane to a nice dinner with just a change of accessories. 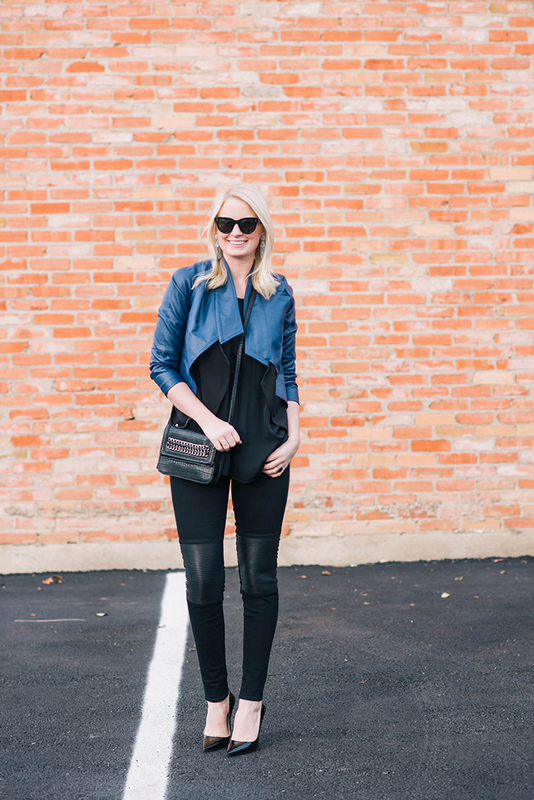 The look of this jacket is super luxe – I love the navy faux leather with the contrasting black ponte knit. It looks chic and layered without any bulkiness. 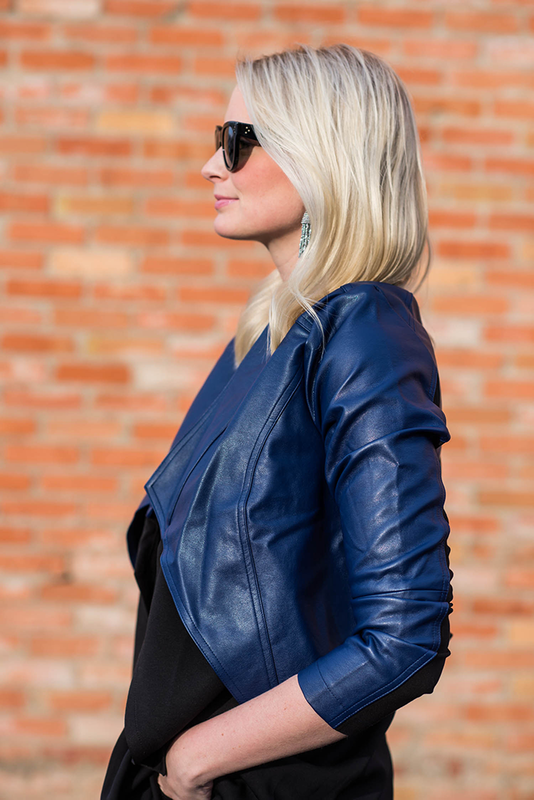 The cascading drape is an elegant touch to make this jacket more elevated for nighttime wear. 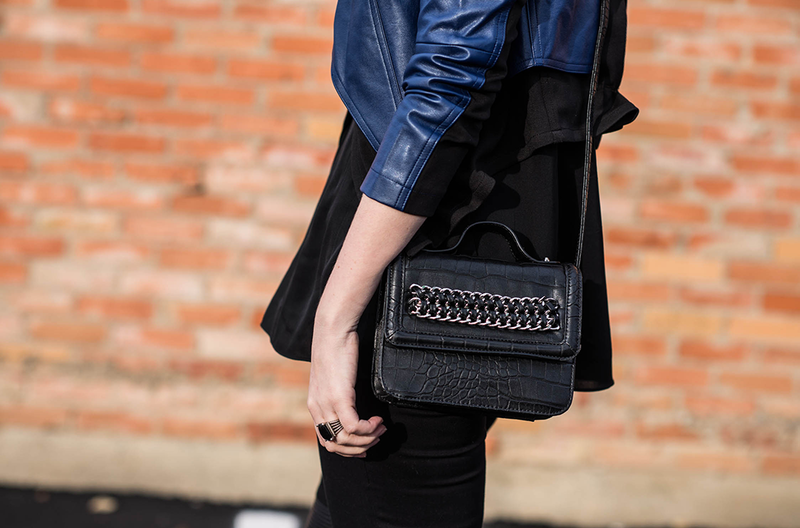 To make this outfit ready for a night out, I added this chain-embellished bag by BCBGeneration. I love how it adds a bit of edge to the ensemble, don’t you? It can be worn as a crossbody or a clutch! Both items are inexpensive and easy to wear, day or night. Sounds like a no-brainer to me! Also, while I was over perusing HSN’s new arrivals, I found a bunch of other pieces worth a look – loving these gray Vince Camuto booties, this fun fringe shoulder bag, this lace-detailed top and these high-waisted skinnies. Also adore this pair of chain-embellished sandals! So ready for spring so I can sport those… Speaking of spring, check back on HSN tomorrow to see the launch of their Spring Fashion Collection! Black and blue is one of my favorite color combos. Love this look and especially these pants. They look amazing on you! This jacket is gorgeous! and I also love the camel and black combo too! Will you share what size you’re wearing? I’m so glad you love it! I actually got a medium and it’s WAY too big. Since you’re smaller than me, I would even suggest getting an XS! Very cool, I LOVE that jacket — and the pink version it comes in! So great to see you style this because I’ve been really curious about her line. I’m a huge fan of hers, and her style. You look gorgeous here! Would never have guessed that came from her, love the shade of that jacket! Absolutely adore this combination – those jeans are amazing! Love this look. I am sort of getting obsessed with blue for the Spring. I guess we were both feeling the black and blue combo this week! Love every single piece you’re wearing here! Love this look! I can’t wait to pull out my brighter blues for Spring. Love the blue and black combo and YES to those jeans! I love the rich blue color! Adore this look. I love Giuliana, too! I had a chance to meet her (plus Bill and her parents!) briefly years ago at a function – they are incredibly nice people. I’ll have to check out more of her collection! LOVE LOVE THIS OUTFIT ! Love this look! That jacket is perfect and the shoes are just to die for! Your style game is always on point! Love the edginess of this look! Love this jacket and eventually I just need to get those jeans. Funny how most people think that black and navy don’t go together, I’ll have to direct them here next time I hear it to prove them wrong ;) Off to check out the collection! love the black and light navy!